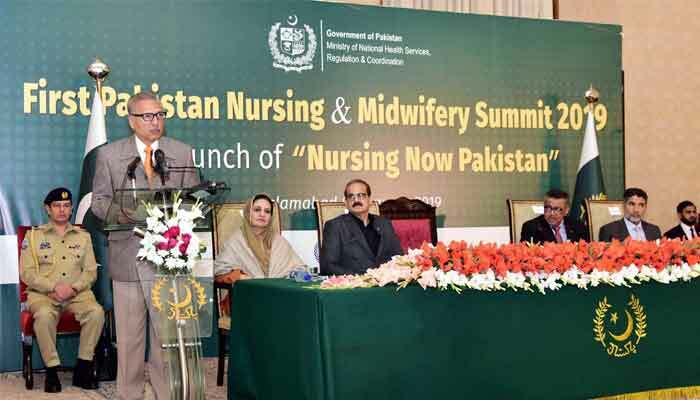 ISLAMABAD: President Dr Arif Alvi on Tuesday declared 2019 the year of nursing in Pakistan to highlight the significant role played by people associated with the nursing and midwifery profession. He also announced launch of the ‘Nursing Now’ chapter of Pakistan, an ambitious project of the Nursing Now campaign which kick-started worldwide in collaboration with the World Health Organisation (WHO) and International Council of Nurses, with the aim to raise the status and profile of nursing. The president made these announcements at the first Pakistan Nursing and Midwifery summit and the launch of Nursing Now Pakistan campaign ceremony held at Aiwan-e-Sadr, Islamabad. President Alvi said the nursing profession is regarded as the backbone of the healthcare sector, and stressed the need for proper education, training and capacity building of the women associated with the nursing and midwifery services, besides imparting them with leadership roles. The president announced that nursing diplomas would be replaced with degree programmes and the government remains committed to double the strength of people in the nursing sector within two years. A national nursing university would be established in Islamabad to provide training to 25,000 people yearly, he informed. Linking the issue of poverty with health, the president underlined the role of health professionals and nurses in alleviating the suffering of ailing humanity and cited certain challenges in the health sector including the issue of stunted growth. President Alvi said that by observing the nursing year in Pakistan, the government would highlight the contributions made by the people associated with this field. He noted that when the country has a healthy population, it would grow economically and lead to prosperity. Lauding the role of Minister for National Health Services, Regulations and Coordination, Aamir Mehmood Kiani, the president assured that the government and he himself would continue playing an effective role in uplifting the nursing profession. The president also stressed upon the need to increase the number of nurses to properly look after patients. He highlighted the need for provision of a harassment-free environment to women preferring to adopt the nursing and midwifery profession and called for their protection, so that they could perform their noble cause without any stress. The president also announced that the government would provide scholarships to students and nurses. Addressing the ceremony, Minister for National Health Services, Regulations and Coordination Aamir Mehmood Kiani lauded the services and contributions made by the nurses in the health sector and said the government is committed to delivering results in the health sector in the years ahead. He informed that a nursing university would be established on the land of National Institute of Health (NIH) and said shortage of nurses would be overcome. Kiani also assured to resolve the issues confronted by nurses as it was the top priority of the government. Director-General WHO, Dr Tedros Adhanom Ghebreyesus and representative of Nursing Now, said the campaign running in 70 countries across the globe would focus on the core areas by enhancing the role and voice of nurses and midwives in health policy-making, encouraging investment in the nursing workforce, and recruiting more nurses into leadership roles with focus on research, proper training and the best nursing practices.